Vocaloids are platforms, communities, revolutionary ones. They are symbols of diversity in a world increasingly dominated by a few, they are invaluable channels for the free expression of minds when asterisks are being put up behind free speech*. Their lack of physical existence and well defined personalities are much needed space for the individual, so they could be what you, as a unique human being, imagine them to be, not a sign that they are manufactured, cheap, manipulatable profit generators of large faceless corporations. Vocaloids empower an average joe’s idea with audiences in the millions, Vocaloids are the face of people who might otherwise shy away from the public stage. The lack of physical existence and well defined personalities is perhaps the greatest difference between Vocaloids and traditional public figures. This void serves an important purpose, they are a much needed space for the individual. Rather than trying to pose as “role models” pointing out what is desirable and what is not, Vocaloids are what you, as a unique human being, imagines them to be, Vocaloids empower an average joe’s idea with audiences in the millions. Vocaloids are invaluable channels for the free expression of minds when asterisks are being put up behind free speech*. As composition could and often is, done anonymously, Vocaloids have become the face of people who might otherwise shy away from the public stage or forced to mask their ideas in fear of consequences for holding unorthodox views. Where else in the world could you find public figures unconditionally championing your views while you remain anonymous? 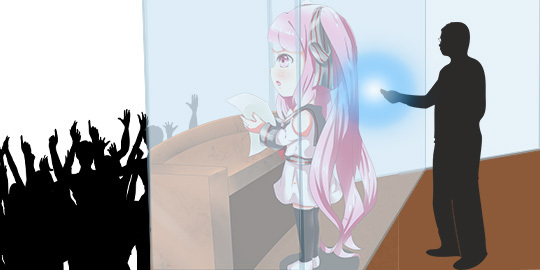 Vocaloids could only continue to serve their purpose if content producers are able to reach an ever expanding pool of audience with them, which is not happening due to new potential audiences being driven away by the misinformed stereotypes portraying Vocaloids as shallow, appearance driven, male dominated objectification of women with no real musical, art or social value, despite clear statistics pointing to the contrary. The community has so far been silent about their mistreatment, which makes it them a perfect scapegoat. With the audience pool shrinking, some producers resort to stock elements unappealing to those outside of a niche or gave up composition altogether. This is a unfortunate and counter-productive situation for both the Vocaloid community and society in general, we cannot allow this to continue. We are a group of concerned Vocaloid supporters who refuses to allow myths and prejudice to set a limit on how far Vocaloids can take us， building a revolutionary crowd-supported campaign that will bring much needed attention to Vocaloids from the academic world.